THE NATION'S much-loved Macca's Kick 2 Kick is back bigger than ever with over 130 fixtures across the 2019 AFL Women's, JLT Community Series and Toyota AFL Premiership Season. With a massive 85 Macca's Kick 2 Kick fixtures featuring across the 2019 Toyota AFL Home and Away season, plus every single AFLW and JLT match boasting a post-game kick, more fans than ever before will enjoy the opportunity to take part in the post-match kick across the country. Eight ambassadors are onboard to support the campaign, Jack Riewoldt (Richmond FC), Luke Parker (Sydney), Ollie Wines (Port Adelaide), Cam Rayner (Brisbane), Reece Conca (Fremantle), Mo Hope (North Melbourne), Amanda Farrugia (GWS) and VFL Northern Blues head of development, and ex-Swans premiership player, Alex Johnson. 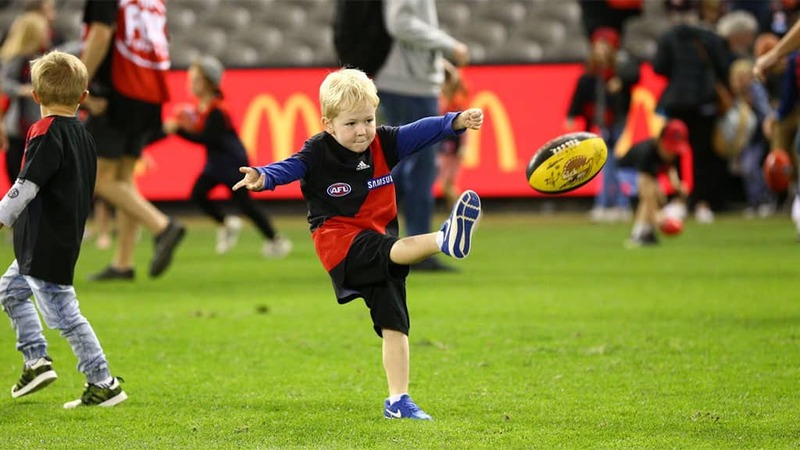 Macca's is also giving fans in every state the opportunity to win a kick in their own backyard, or even the Ultimate Kick 2 Kick on the MCG prior to the 2019 Toyota AFL Grand Final, with the ambassadors. Jack Riewoldt, who has been an ambassador for McDonald’s since 2015, said: "I love that Macca’s gives fans the opportunity to have a kick on such hallowed turf across Australia. "Seeing your idols walk off the field then being able to get down on the grass with your footy, that’s special. It’s very rewarding being part of something that fans and families alike can get so much out of." Brydie York, director of media and sponsorship at McDonald’s, said: "We’re proud that our partnership with the AFL gives something meaningful back to the fans who watch our great game." "What better way to finish a day at the footy than by participating in Kick 2 Kick yourself and having a run around on the pitch. If we can play a small part in encouraging more families to attend the football and providing wonderful memories, then it’s mission accomplished." McDonald’s, the official restaurant of the AFL, is in its seventh year of partnership with the AFL.